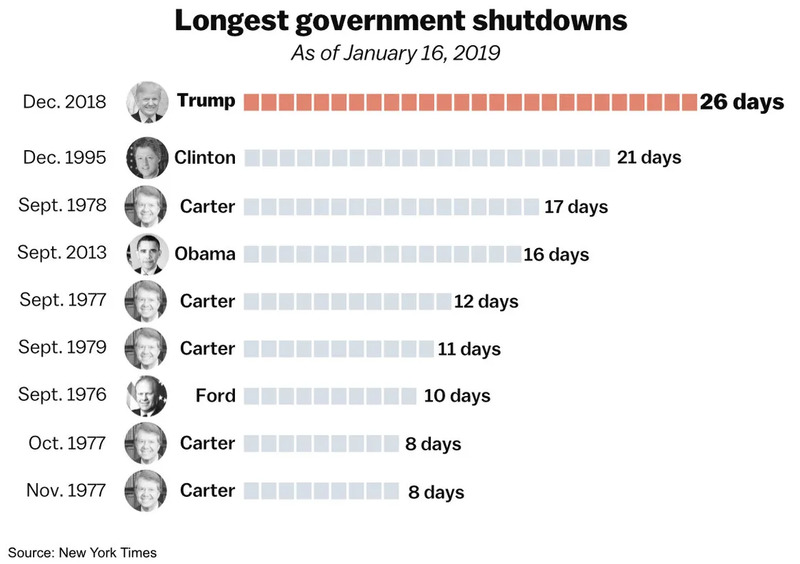 As the Government shutdown comes to an end there may be some confusion surrounding what was the longest government shutdown in history. For those unfamiliar with a government shutdown, it occurs when Congress cannot agree on a budget to fund the government and they pass the deadline to agree on the said budget. Typically, shutdowns occur as a result of a lack of compromising between both parties. In the past, a government shutdown occurred when the Republican party refused to fund Obamacare. 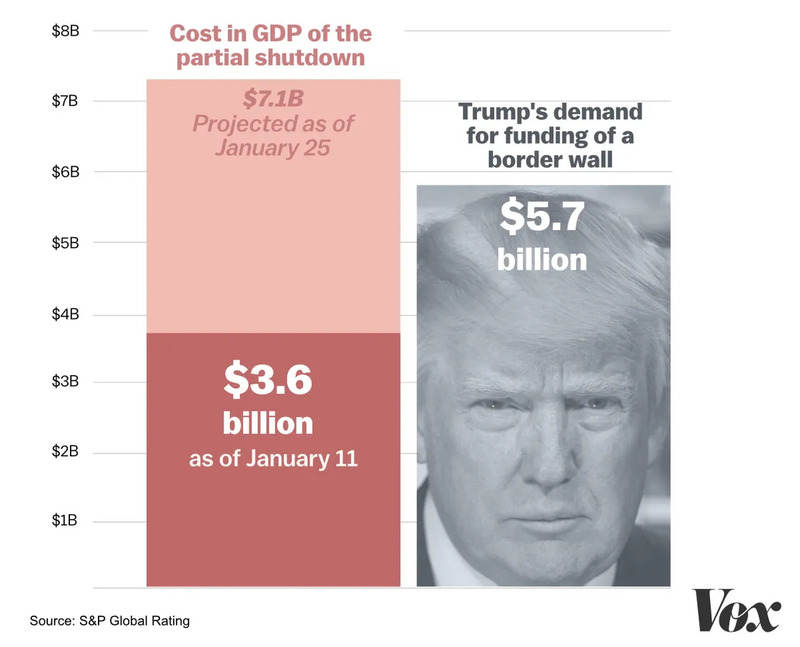 In this case, the shutdown occurred when Congress refused to fund Trump's wall and he refused to sign off on a budget that did not fund his wall. During a shutdown, federal government departments are shut down and not operational. This shutdown was technically a partial shutdown meaning some departments were left open namely the military and the National Institute of Health. However, national parks are not operational as well as several other services like the USDA (you know the people who make sure the food you're eating is safe) with roughly 800,000 people left without a job. While the government was shutdown, the US lost roughly $6.5 billion a week. This a combination of a loss in tax income and spending of said paychecks from close to a million paychecks, loss of sales from retailers around national parks and an overall halt in the US economy. Luckily there is talk of backpay for many government workers, where congress agrees to reimburse federal workers for their lost paychecks. However, that promise does little to help workers struggling during the near month-long shutdown, and it is not written into law that congress and the president have to award backpay to workers. In this case both congress and Trump did sign a bill ensuring federal workers will get back pay as soon as possible but that does not include any contract workers as they get paid by project completion. Roughly 4.1 million people are estimated to work under contract for the federal government and will most likely not receive backpay from this shutdown. These workers also tend to have the low wage jobs, working in the cafeteria, as a security guard, or researcher. Nearly 80% of Americans live paycheck to paycheck so to take a paycheck from nearly a million American workers over a political agenda is devasting, especially when nearly half of those workers may never be reimbursed. So many media outlets talked about federal workers picking up odd jobs to support themselves during the shutdown however in many departments it is illegal for workers to do so. If federal workers want to take on a second job, they have to receive preapproval from an ethics lawyer in their department to ensure they are not violating any ethics laws. For example, if someone works for the FDA in drug approval it would be considered unethical for them to take up a job at a big pharmacy company to give them insider tips on how to get their drug approved. Obviously during a shutdown workers cannot get approval to work a second job when their ethics lawyers are also furloughed. 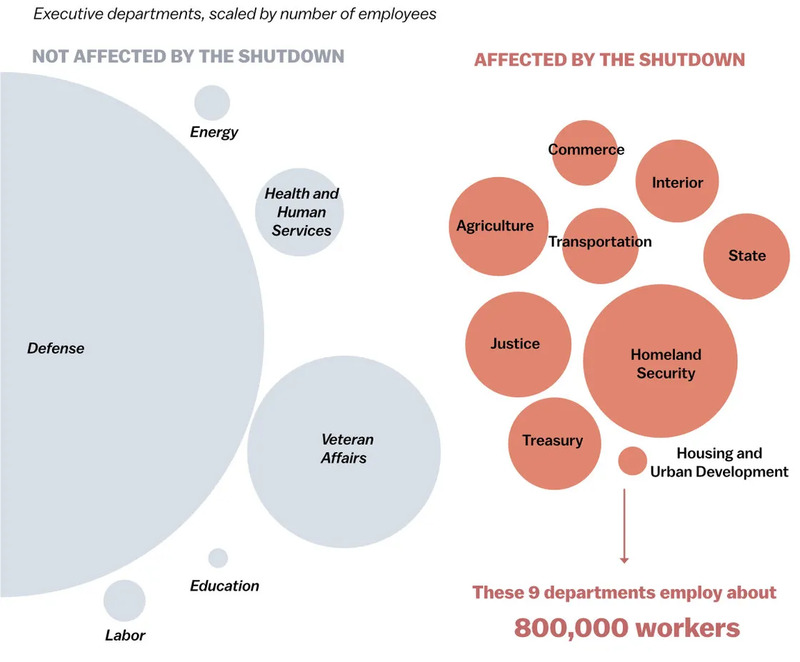 Yet now that the government is open, workers who did obtain second jobs during the shutdown could face consequences such as termination or a loss of pension for acquiring another job to feed their family. Furthermore, if the employee is one of the roughly 400,000 federal employees considered essential during the shutdown and is still working, just without pay, it may be difficult to work full time for free and pick up another job that pays especially considering the consequences. Another option for federal workers is to file for unemployment during the shutdown, but now that the shutdown is over, they have to pay everything back, despite not receiving their paychecks back and still having their bills to pay. Many workers reccount having to max out their credit cards to survive the shutdown. So what was this shutdown for again? To get funding to build a wall. Funding that we didn't have; yet just spent on a government shutdown. Trump held our workers and their families hostage, in a temper tantrum to build his precious wall in order to keep out immigrants, something this family member of a federal worker is very opposed to. Why is my family, and many others, put on edge and held in an impossibly difficult situation, where we have to chose which bill to pay, hoard our cash, put everything on a credit card and bring ourselves close to, if not complete, financial ruin to placate a toddler? As of now the governement is open yet another shutdown looms if a deal is not met by Feburary 15th. This past shutdown was stopped by just 10 air traffic control workers in Virginia and Florida, essential federal employees, who had been working the last month without pay. On January 24th they decided to stay home effectively halting air traffic in New York's Laguardia airport, New Jersey, Philadelphia and Atlanta. They caused Trump to call a three-week cease fire, giving some relief to workers around the country and proving the importance of action, even on a small scale. Should another shutdown occur on the 15th, hopefully air traffic control workers, and other 'essential' but unpaid workers will be able to show solidarity and stay home, disrupting business as usual and stopping a system that believes in holding it's people for ransom for their own political gains. Allaire is a Sociology major and Women and Gender Studies minor with aspirations to be a human rights lawyer and a songwriter with a passion for writing and social justice.